Direct transfer from your bank to the Bank of China is preferred for factory production. It is the professional method of payment among international traders. All our bank info will be emailed to you if you choose this most popular method. It only takes one or two days for the transfer arrival if your bank has direct correspondence. Chinese banks are open all weekend! This helps to expedite your production. Hidden bank fees deducted will be charged back to the you. These can be incurred if you have a smaller home town bank. 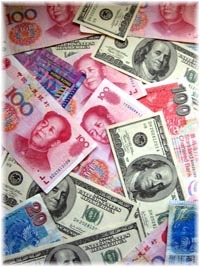 Many larger banks with international, commercial business divisions have direct correspondence with Bank of China. Don't worry, if yours doesn't, the transfer is still easy. However, a third bank will become involved, and they often charge an additional US$10-30 fee to assist your bank in the transfer. Our low FOB quotations do not include this possible hidden fee. Any transfer that arrives short the correct amount will be re billed to you. Sorry to say that $30 is a weeks salary for some employees and we can't absorb the loss. Any wire transfer shortage can be paid for via PayPal. Bank of China charges nothing to receive payments at our end. Referred to as an "LC", it is a formal financial document utilized in large international transactions. Normally used by "container" customers, or for high value goods, often in the millions of dollars. Both our banks would be involved. It offers protection at both ends for successful conclusion of production and delivery. You can inquire with your commercial banker. LC's are troublesome for small dollar amounts. We prefer direct wire transfer to our Hong Kong or Beijing banks. Domestic distributors and wholesalers often offer credit terms of purchase. In China, goods are only produced after payment is made, and not shipped until paid in full. No "terms" are given. Discounts can be allowed on large orders from single factories. Total, final payment is always due before goods leave the production site. "International trade through Cyber Import is as easy as a visit to your local store"
We now accept this convenient, on-line card service for payments less than US$1500. Your production can get launched quickly. The common international import/export transaction is via bank transfer. Unlike retail, we do not include credit card fees when calculating our low FOB prices. Because we often work on razor-thin 5% margins, to accept this manner of payment requires a surcharge. This helps to cover both the 3.5% fee charged initially by PayPal, and their additional 2.5% exchange rate "fee" incurred when wired to Hong Kong and converted to its currency. It is time consuming and costly. However, we accept PayPal for the convenience of small payments from importers. It is often cheaper to send payment via a bank wire transfer, our preferred method for payment. Credit card use within China is highly limited. We know of no factories or exporters that utilize them. Currently we are unable to accept plastic for transactions, although we understand the convenience to use charge cards. There is a considerable savings for low value transactions. We will endeavor to accept credit cards as soon as it is possible from China. That info will be provided here as it becomes available. Please note that the more sophisticated online banks now allow you to send wire transfers directly from your computer. For those of you seriously interested in international trade, we suggest you inquire with your banker. Personal checks, cashiers checks, and money orders are NOT accepted due to the complexities of international banking and extraordinary length of time needed for processing. If you mail us payment via this method, the document will be voided and returned.